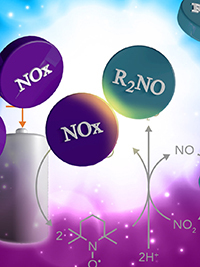 Two metal-free catalysts, known as NOx and R2NO, can approach the efficiency of platinum in fuel cells, according to scientists at the Center for Molecular Electrocatalysis. Image: Nathan Johnson, PNNL Multimedia. Enlarge Image. Generating power without gasoline, diesel, or coal could change our nation's energy and security landscape. However, replacing technologies that use fossil fuel with ones that require rare metals is unsustainable. And, that's part of the problem for fuel cells. The cells use hydrogen generated at solar and wind stations to produce electricity, heat, and water. But, the cells require platinum to speed the reactions. Scientists at the Center for Molecular Electrocatalysis (CME) have found another way. By combining two simple, inexpensive, metal-free catalysts, they sped the cell's slower reaction, taking protons and electrons derived from the hydrogen fuel and combining them with oxygen to pump out water, a reaction known as the oxygen reduction reaction. "The results show that simple molecules can approach the efficiency of platinum in the oxygen reduction reaction," said Dr. Shannon Stahl, a CME member and a professor at the University of Wisconsin-Madison. "The next step is to show that such catalysts exhibit good performance in fuel cells." Why It Matters: Platinum is an expensive and rare metal that raises the cost and limits the availability of fuels cells. 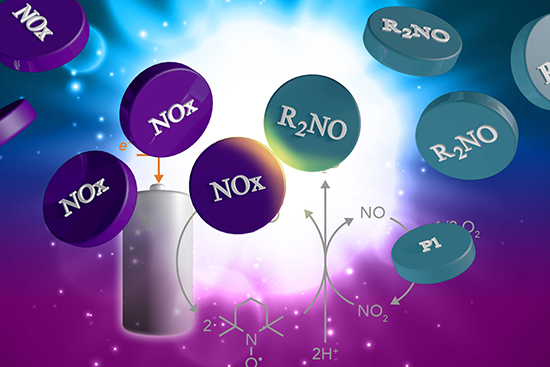 Researchers Dr. James Gerken and Dr. Shannon Stahl at CME used two metal-free catalysts, an organic nitroxyl (R2NO) molecule and inorganic nitrogen oxide (NOx) source, to promote oxygen reduction. This research takes an important step in showing how oxygen reduction could be catalyzed without metals or traditional, single catalysts. Depiction of the nitroxyl molecule (left) and nitrogen oxide (right) cycles working together to reduce oxygen and generate water by interacting with each other and the cathode of the fuel cell. Methods: Based on their years of experience with oxygen and catalysts, Gerken and Stahl took a different approach to the reaction. They didn't adjust a metal catalyst; they began with two nitrogen-based catalysts. Neither catalyst -- the nitroxyl catalyst nor the nitric oxides -- is effective when used alone. However, they work efficiently in tandem. The nitric oxide catalyst and oxygen rapidly form NO2 in the electrochemical cell. 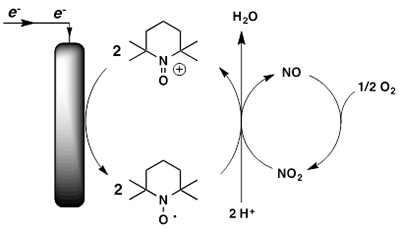 The NO2 then works with the nitroxyl catalyst to interface efficiently with the electrode, where water is produced. The catalyst combination is an effective partnership to convert oxygen to water. After the reaction is finished, both catalysts cycle back to their original states and begin the process all over again. Hydrogen peroxide is often formed in the oxygen reduction reaction and contributes to degradation of the fuel cell. The nitoxyl/NOx catalyst pair, however, avoids the creation of hydrogen peroxide. "While the nitrogen compounds aren't the final solution, this approach provides an avenue to explore simple, inexpensive, and completely metal-free catalysts," said Dr. Aaron Appel, CME Deputy Director. What's Next? By replacing platinum with cheaper chemicals, the scientists' work illustrates and approach to address a major barrier to wider fuel cell use. Now, the researchers are exploring other catalysts. Their goal is to refine the reaction to replace nitrogen dioxide while keeping eco-friendly, metal-free catalysts. Sponsor: Center for Molecular Electrocatalysis, an Energy Frontier Research Center, funded by the U.S. Department of Energy, Office of Science, Office of Basic Energy Sciences. This article was co-written by Michelle Harris, Frontiers in Energy Research Editorial Board.